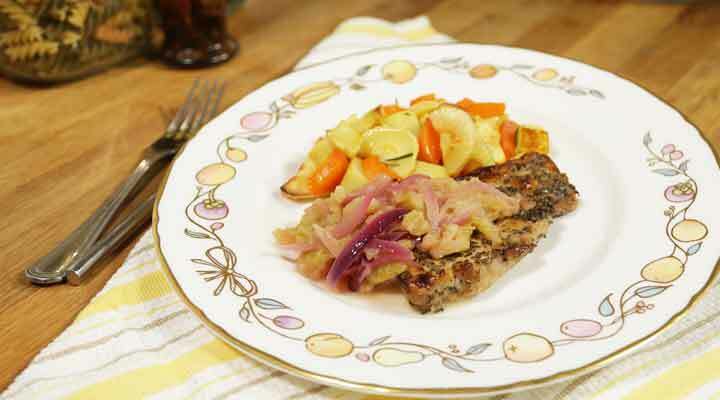 Operation Transformation Recipe - Pork Chops and Apple Sauce served with Mixed Vegetables. Preheat oven to 220C / 200C fan / gas mark 7. In an oven dish combine diced potatoes, chopped carrots, parsnips, potatoes, 2 teaspoons of olive oil and rosemary. Place dish in oven for 20 minutes approximately. In a bowl mix the Worcestershire sauce, sage and honey. Add pork chops to the bowl and coat with the sauce and place aside. Combine the peeled and diced cooking apples with the chopped onion. On a separate baking tray place 1 teaspoon of oil and spread diced apple and onion onto it. Now add pork chops on top of diced apple and onion on baking tray and place in oven. Cook for 20-30 minutes until cooked through. Serve pork chops with vegetable mixture.